How does the Lanaform Lumino Plus daylight lamp work? How do you have to use the daylight lamp? The Lumino Plus daylight lamp from the brand Lanaform helps against winter depressions, which are also referred to as seasonal depressions. When people have a winter depression, they commonly have a rather gloomy mood, a lack of energy and they feel much fatigue during the winter and autumn months. There are also other symptoms which can arise with a winter depression, such as sleeping problems, a general sluggishness and a different eating pattern. These complaints usually do not arise in the spring and summer. The reason for such a winter depression is the lack of daylight. Due to the short days and the cloudy weather, we do not get to see as much sun light as we actually need. This can have a negative influence on the mood. The Lanaform Lumino Plus light therapy box compensates the lack of daylight. This way, the light therapy eases the symptoms of a winter depression. The Lumino Plus daylight lamp has a light strength of 14,000 lux. This is much stronger than the natural sun light on a cloudy winter day, on which the light strength is only 1000 lux outside and even lower (500 lux) inside the house. As a comparison: In order to feel good, a human needs at least 10,000 lux. The light coming from the Lanaform daylight lamp starts a chemical process in the brain. This has a very positive effect on the mood: Due to the extra amount of light, you feel less sluggish and tired. The light intensity is highest when you sit relatively close to the lamp. If you sit further away from the lamp, it will take a longer time to get to the desired result. Depending on the distance from the lamp, the recommended duration of the treatment amounts to 20 minutes to 2 hours per day. In most cases, a 7-day course of treatment is already enough in order to ease the symptoms of a winter depression. The light therapy is safe for the skin and very effective. Place the Lanaform Lumino Plus daylight lamp on a steady underground and select the desired light strength. The device has two settings: setting 1 and setting 2. If you select the first setting, there will only be two lights shining. This way, the light intensity is relatively low. The second setting turns on all three lights so that the light intensity is on a maximum level. In the package leaflet, you will find a table which shows how long you have to sit in front of the lamp depending on the strength and distance from the lamp. However, please do not look directly into the light! You can easily read, have a phone call or watch TV during the treatment. You should pay attention to staying close to the device, though. The light has to be able to reach your eyes easily. It is best to use the daylight lamp in the morning. We do not recommend using the lamp after 8 pm: this can cause insomnia. 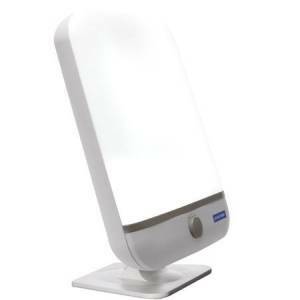 Dokteronline.com has the Lanaform Lumino Plus daylight lamp in the standard version in stock. Furthermore, there are also light therapy products which are used for other diseases, such as hay fever or an allergy.